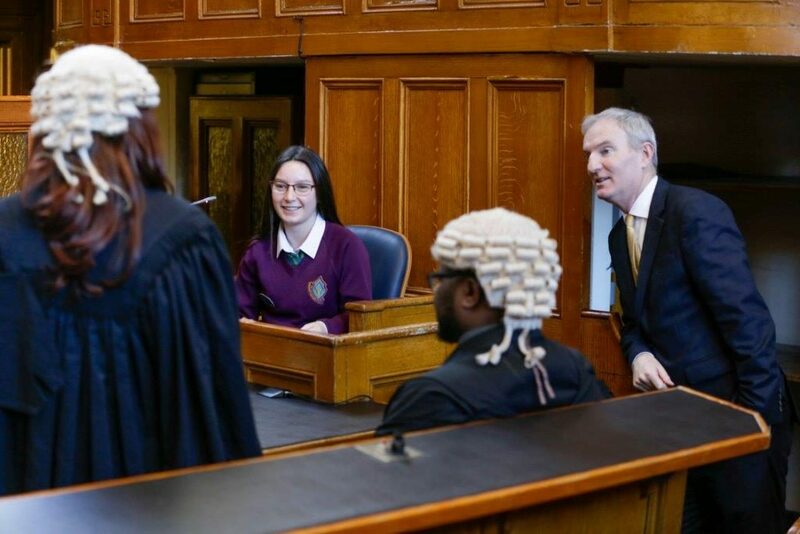 I was very excited when I found out that our school was being offered the opportunity to send one student to The Bar of Ireland for a week of work experience called Looking into Law. I really wanted to take part in this course as I am almost 100% sure I want to study law when I finish second level education. I knew I couldn’t pass up an opportunity like this. I was ecstatic when I heard that I had been selected to take part. This course was either going to make or break my career choice. The course took on 100 TY pupils. On my first day, we were broken into groups of 5 and assigned a host barrister. We would shadow or barrister each day from 9:30am – 1pm. I was fortunate enough to experience first-hand and learn many different sides of what goes into a case, the general process of how a case is initially planned, developed and completed; as well as how much work and detail goes into every stage. Another valuable lesson I have learned during this week, were the many different types of work a barrister has to perform, which in turn, have provided me with more insight into the different types of roles and responsibilities that I could perform, as a barrister. I really enjoyed visiting the different courts like the Criminal Courts of Justice and The Four courts. We got to listen to some really interesting court cases such as the Slurry tank murder trial. We also sat in on some boring cases about unpaid parking tickets and not having a T.V. licence; this allowed me to see both the glamourous and the monotonous side of a career at The Bar. I also enjoyed chatting with my class mates about what college or profession we are all looking into after school. The chance to get to know other students from all over the country who have a similar interest in law really helped me by giving me insight into why others would be interested in such a career, hence allowing me to become aware of the pros and cons I may not have previously considered. We received a number of talks, including talks from a defence solicitor, members of the Garda Siochana and the DPP, a legal affairs correspondent and even a judge! My favourite was the talk from the DPP. Personally this talk scared me out of doing anything considered “bad”. I’m assuming that was the point. I really liked this talk as it was the most engaging. It gave me a real idea of how the legal system in Ireland works and I found it extremely interesting, even compelling. I collected information I wouldn’t have been able to find online. We heard empirical stories of how so many barristers and solicitors made it to where they are today. How they built their careers and we got to hear their personal thoughts and opinions. I thought this was amazing as so many of us would probably never have gotten the opportunity to do so at such early stages of building our future careers. This Law programme was an incredibly rewarding experience for me. I think that this course was a magnificent idea and was extremely beneficial to all involved. I also believe that a course of this type would be advantageous to all future students who are interested in or curious about a career at The Bar, or in law in general. I cannot express enough how grateful I am for being given this opportunity. Thank you for taking the time to set up a programme like this to help and educate children like myself who are interested in law. I sincerely appreciate the time and effort that had to be put in to make it all happen. Thank you!